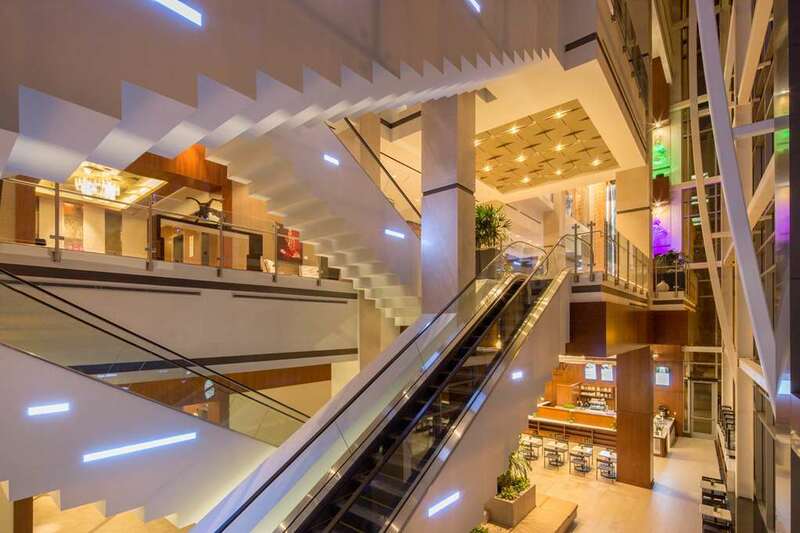 Discover the best that the city of Norfolk VA has to offer from the stylish Hilton Norfolk The Main. Set in the heart of downtown with beautiful views of Elizabeth River the hotel offers easy access to a wealth of restaurants shopping outdoor recreation night life and attractions. You don*t have to leave our Norfolk VA hotel to enjoy world-class dining. The hip urban Saltine offers the region*s finest seafood and a huge selection of wines and craft beers. Our wine and piano bar VARIA serves upscale trattoria-inspired Italian fare from its open kitchen. and our relaxed rooftop bar and lounge Grain features terraced patios with trees and lighting designed to invoke an inviting backyard garden vibe. Take in views of downtown or the river from your guest room or suite. Feel at home with WiFi a flat-screen TV and an ergonomic desk. Choose an Empyrean Club Level room to enjoy perks like continental breakfast evening hors d*oeuvres and a bar. Maintaining your exercise routine is easy at this downtown Norfolk VA hotel with an indoor swimming pool and a state-of-the-art 24-hour fitness center. Boasting 42 000 sq. ft. of meeting space and a 20 000 sq. ft. conference center this hotel is the ideal venue for your wedding conference or banquet. Choose from a variety of rooms and breakout spaces including an 18 500 sq. ft. ballroom. Contemporary A/V technology inspired catering and our dedicated staff will ensure your function is a success.